When you encounter a matrix problem in finite math, a nice way to illustrate the transition from one state to another is to use a transition diagram. The different states are represented by circles, and the probability of going from one state to another is shown by using curves with arrows. 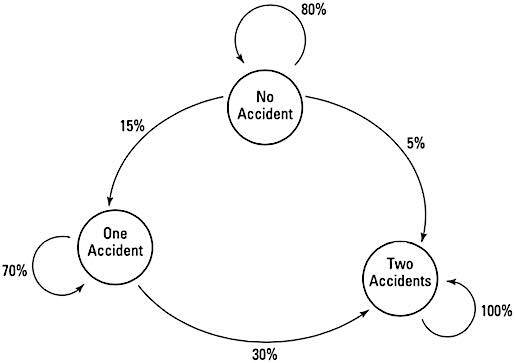 The transition diagram in the following figure shows how an insurance company classifies its drivers: no accidents, one accident, or two or more accidents. This information could help the company determine the insurance premium rates. Eighty percent of the no-accident drivers probably won’t have an accident. You see that 80% of the drivers who haven’t had an accident aren’t expected to have an accident the next year. Fifteen percent of those drivers have one accident, and 5% have two or more accidents. Seventy percent of those who have had one accident aren’t expected to have an accident the next year but have to stay in the one-accident classification. And those in the two-or-more accident class have to stay there. 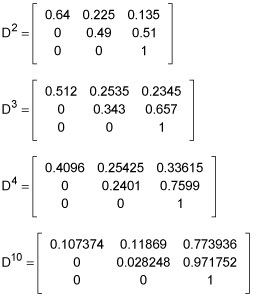 To create a transition matrix representing the drivers, use the percentages to show going from one state to another. What is the long-term expectation for these drivers? First, let the transition matrix be D.
What this tells the insurance company is that, in ten years, about 11% of the original no-accident drivers will still not have had an accident. Only 3% of the one-accident drivers will still have had only that one accident. This situation doesn’t allow for the drivers to move back or earn forgiveness; a one-accident driver can’t be a no-accident driver using this model. Of course, different insurance agencies have different policies, putting drivers in better standing after a set number of accident-free years. And new policyholders are added to make this picture rosier. This just shows the pattern for a particular set of drivers after a certain number of years.